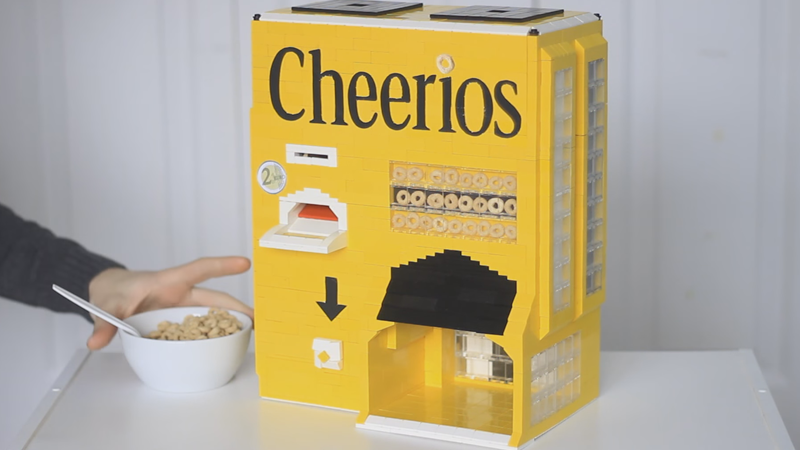 Who Wouldn't Want a Lego Cheerios Machine to Make Your Breakfast? Getting up in the mornings can sometimes feel like a daunting task—sometimes preparing yourself breakfast, even just a simple bowl of cereal, even more so. Wouldn’t all be better off if we could just build a machine out of Lego to do it all for us instead? Probably. I look forward to our Lego vending machine future. You might recognize the familiarity of the Cheerios machine—it’s from Youtuber AstonishingStudios, who recently had us lusting for a similar bit of Lego tech that dispensed McDonalds Chicken Nuggets. The Cheerios machine, which you can see in action below, works in a similar way, powered by Lego’s “Mindstorm” electronics pieces. The machine doesn’t just dispense you a nice bowl of milk and cereal—in around 30 seconds, which isn’t half bad—it uses the Mindstorm pices to also sort currency, as the machine will only accept 2 Euro coins, and nothing else. On top of that, the build itself is very nice, from the Cheerios color scheme to the cutesy little cereal display, and even a little slot that stores your spoons. Naturally you’ll have to take bits of it apart at some point to restock the milk and cereal, and the actual act of building one of your own will probably take ages to, but it’d be nice to have some automated cereal-based-bliss on those mornings when you’re too knackered to do things yourself.